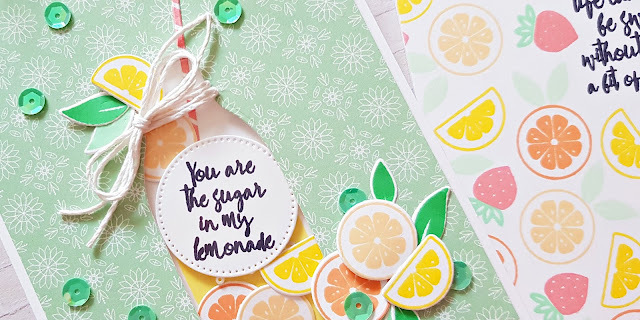 I'm back today with some new cards using products from the January Pinkfresh Studio release. I tried to use sets that I haven't before but well, I wasn't quite successful hehe. There are just some stamps and dies that I can't get enough of! One of these is the Embroidered Blossoms stamp set. I've only used the stamp on today's projects but there are coordinating dies available as well. For all of my cards I've used an A2 size top folding card base. 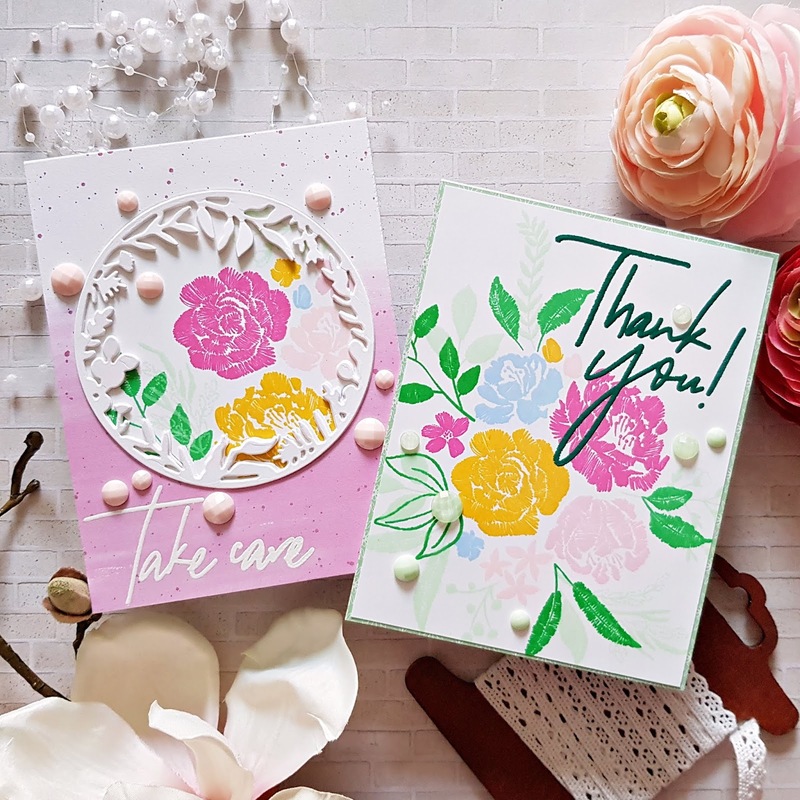 I cut the same size patterned paper panel for both of these floral cards, using the gorgeous new Everyday Musings collection. 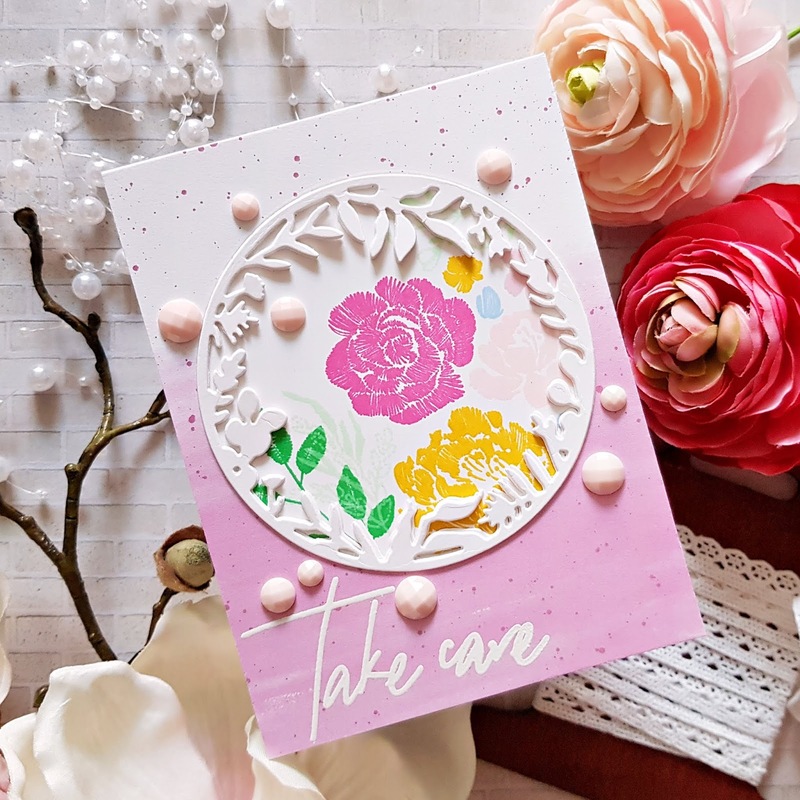 For my first card I cut a slightly smaller piece of white card stock too, which I then stamped my bouquet on. I pulled the colors from the Everyday Musings collection. For my sentiment I chose Thank You! 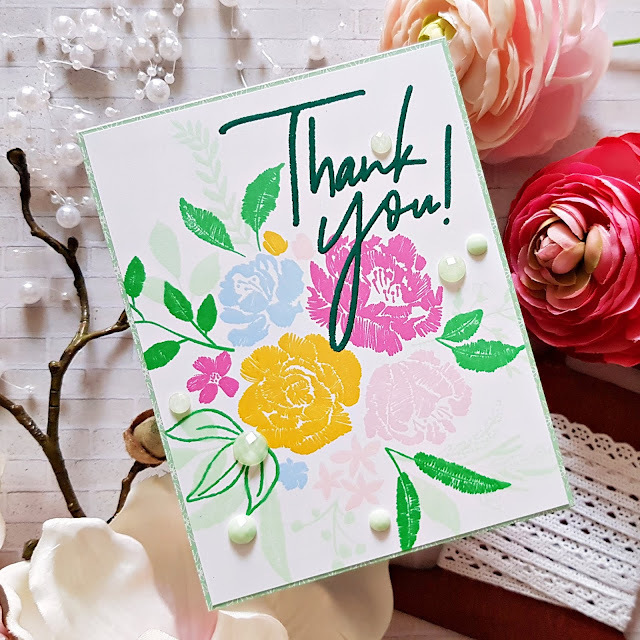 from the Scripted Bold Sentiments 1 stamp set. I stamped it in embossing ink and embossed it with dark green embossing powder. I totally messed this up, I got distracted and didn't pour the powder on right away, so when I did minutes later, I didn't get a full coverage. Shoot. But I wasn't going to give up at this point and waste the panel I worked on for what felt like hours haha. So I heated it, then stamped over it again and embossed it again. Of course I didn't stamp in the exact same place, so I don't have sharp edges BUT! I totally love the look because it almost looks embroidered which goes with the flowers! I think, anyway :). I adhered the panel to the card base and added some crystals to finish off this card. On my next card I used the Circle Frame with Botanicals die to die cut a window from the patterned paper panel. I stamped some flowers and greenery on a white piece of card stock, once done, I adhered it to the card base, then layered the patterned paper on top. I then die cut 4 or 5 circles from white card stock, using the above mentioned die. 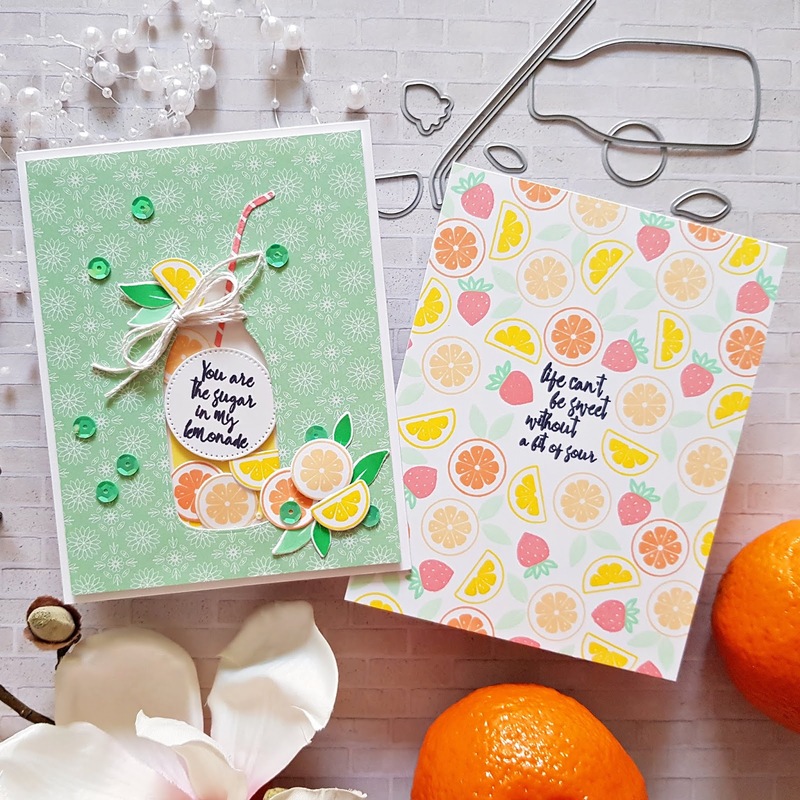 I glued these together for a dimensional look and adhered them to the card front. 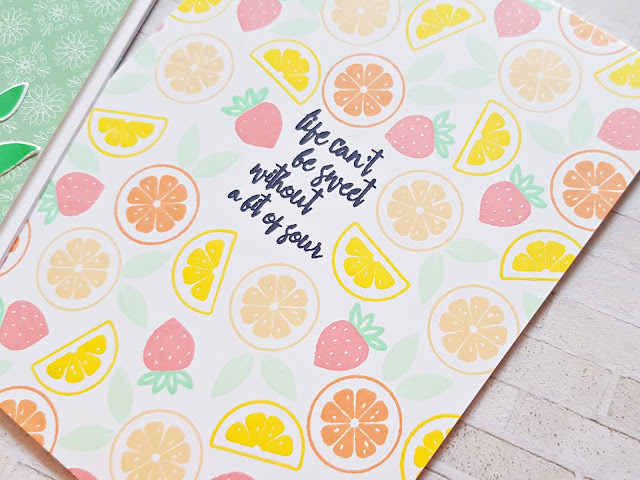 I embossed a sentiment at the bottom, using the Scripted Bold Sentiments 1 stamp set again. A few matte crystals finish off this card too. 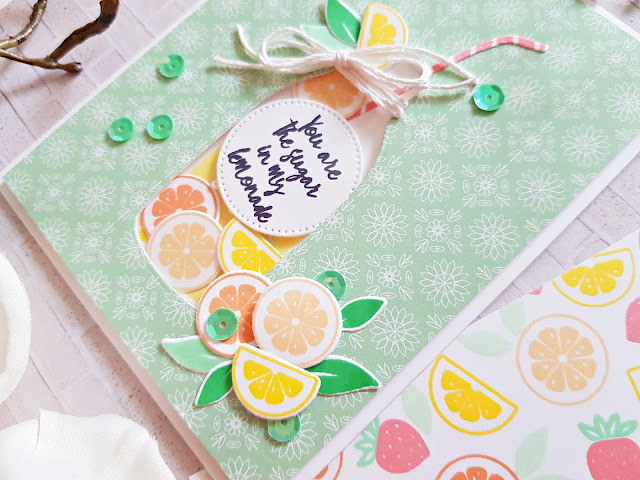 OK, so on my next two cards I did actually manage to use a set I haven't before: the Sweet Lemonade stamp and coordinating die sets. Oh my Gosh, this set is so adorable! It is tiny, the fruits are so small and cute! 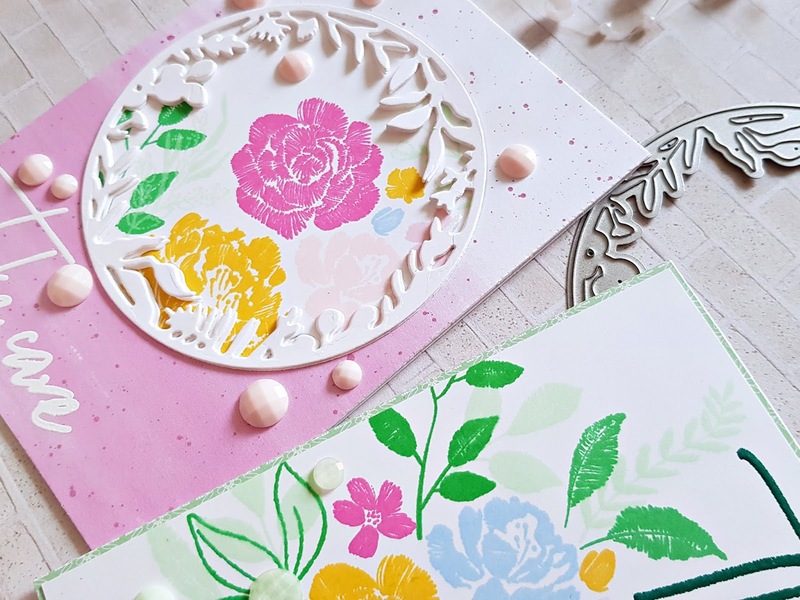 Obviously I had to create a one layer card with just stamped images! 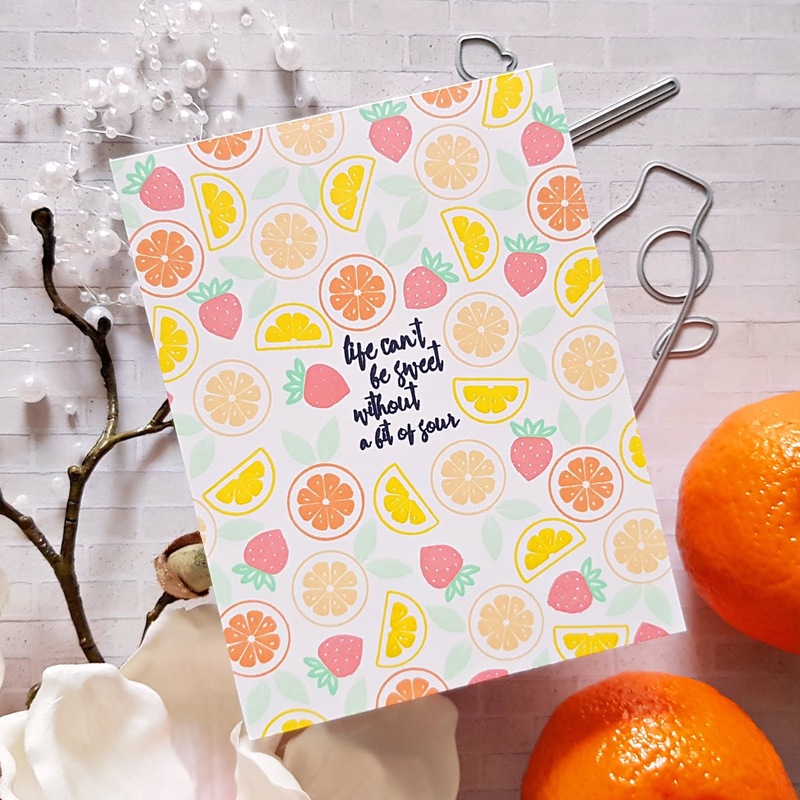 I first stamped the sentiment in black, then started stamping lemons, oranges and more. To avoid odd white spaces, I first stamped around the middle and then moved outwards. And that's all there is to it really. It takes a bit of patience maybe, but it's very simple. I decided to not add any embellies because I didn't want to cover up any of the stamping. Last but not least I created a shaker card. I first die cut the bottle from patterned paper which is slightly smaller than A2 size - maybe about 4x5.25". I then placed it on a 4.25x5.5" white card stock and stamped the "drink" in yellow. Too bad I covered it all up because the tiny bubbles in that image are to die for! 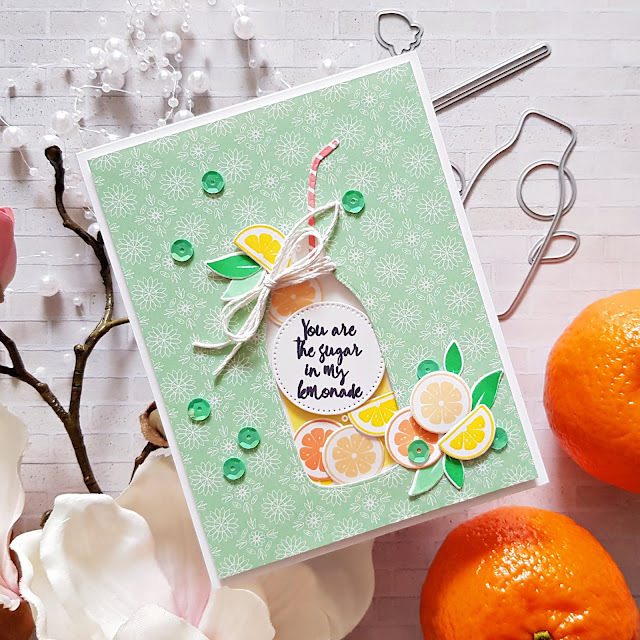 I stamped and die cut a bunch of fruits and leaves, a straw and I even die cut my sentiment using a basic circle die. I wanted it to be a shaker element too. I added acetate behind the window, then foam tape for dimension. 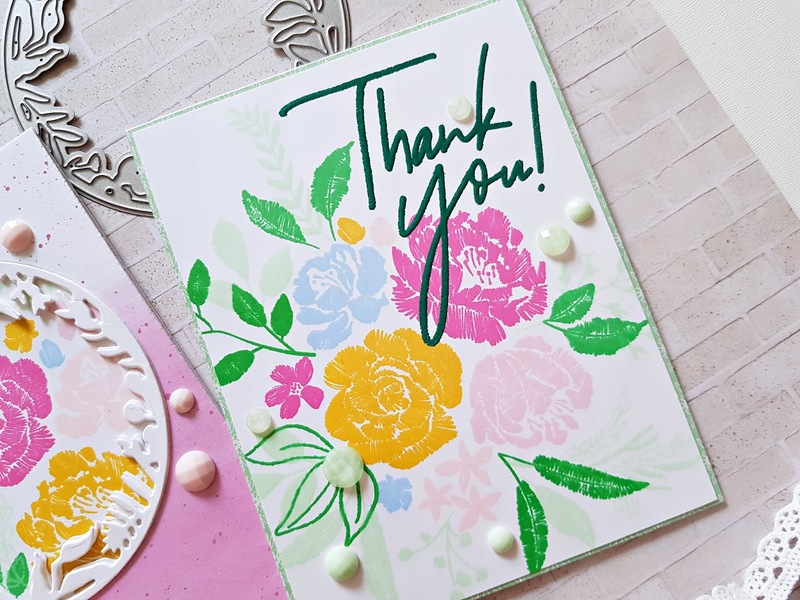 I cut apart the straw and glued the bottom part directly on the white panel, the top part I glued onto the green patterned paper. I placed some sequins, seed beads, the die cut fruits and sentiment in the middle and adhered the panel down. Most of my beads and sequins are probably stuck on the side of the foam tape because there's hardly any visible haha. Next time I'll just glue some of them down so they stay put. I added a few sequins, more fruits and some twine around the neck of the bottle. Done! That's it for today! I hope I could give you some ideas on how to use some of the new stamp sets.